David Brooks supports the nomination of Judge Sonia Sotomayor to be an Associate Justice of the Supreme Court. Brooks is a veteran journalist and political commentator, now a columnist for The New York Times, in addition to commentating on TV. At the NYT, he’s seen as the resident conservative. He does, indeed, seem like a reincarnation of Ronald Reagan in the minds of the denizens of that leftist swamp. In reality, Brooks is a moderate who is capable of leaning left or right, depending on the merits of specific issues. His judgment is sound, and his opinions are respected. That mention of who Brooks is leads-in to a discussion of the position he took in his column in The New York Times yesterday. It’s important to understand that while his desk is located at the NYT, his mind is free. After some thought and research, Brooks has concluded that Sotomayor is both more and less than she appears to be — and it’s all for the good. 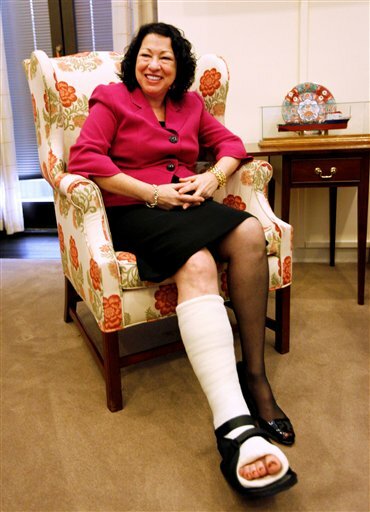 [Sotomayor] happened to attend Princeton and then Yale Law School in the 1970s. These were the days when what we now call multiculturalism was just coming into its own. These were the days when the whole race, class and gender academic-industrial complex seemed fresh, exciting and just. There was no way she was going to get out of that unscarred. And, in fact, in the years since she has given a series of speeches that have made her a poster child for identity politics. In these speeches, race and gender take center stage. It’s not only the one comment about a wise Latina making better decisions than a white male; it’s the whole litany. If you just read these speeches you might come away with the impression that she was a racial activist who is just using the judicial system as a vehicle for her social crusade. In short, Sotomayor’s career surpasses the crude categories she sometimes articulates. Despite the ideas she picked up while young, she has, over many years, chosen to submit herself to the discipline of the law, and she has not abused its institutions. I hope she’s confirmed. That reinforces the opinion I’ve already formed. Sotomayor is a liberal, for sure — that’s what you get, folks, when you elect a liberal president and give the majority in both houses of Congress to Democrats. Nothing wrong with it; that’s just the system working as it should. Far as I can tell, aside from an unfortunate tendency to run her mouth too much now and then about race and ethnicity, she’s a pretty solid judge. Don’t take my word for it — listen to David Brooks. You’ve sourced one of the few journalists I trust and I will take his word for it with one reservation. I’ve heard that almost half of her decisions while serving on various courts have been overruled by higher courts. Now that may just be a nasty rumor started by her many Conservative detractors or it may be something that brooks neglected to mention for some obscure reason. I’d sure like that either confirmed or denied by a person like Brooks. If its true it certainly doesn’t speak well of her Judicial abilities. With any luck, she’ll end up being Obama’s biggest mistake in the same fashion that Earl Warren was Ike’s. The 60 percent reversal rate by the Supreme Court is a either a red herring used by people who know better or it’s an argument used by those who don’t know how the system works. First, cases are appealed to the Supreme Court very selectively, beginning with the decision of lawyers on whether they have appealable issues. Second, the Supreme Court declines to hear most of the cases brought to it. Third, the Supreme Court overturns a large percentage of the cases it hears on appeal (68 percent in the 2006-07 term, over 70 percent in the term before). That makes sense because they only choose to hear cases that they think are ripe for consideration. If you look at all the appellate decisions she has written, only 1.3 percent of them have been overturned. Not bad at all. Take a look at FactCheck.org. Also read this. One interesting factoid in this article is that Justice Alito’s reversal rate was 100 percent at the time of his nomination, using the same logic by which it’s being said the Sotomayor’s reversal rate is 60 percent. In Alito’s case, no one made a big deal about it. I made it clear in The Sotomayor Nomination that I didn’t like the fact that the Obama Administration’s selection criteria made it virtually impossible that a nominee who wasn’t a female minority could be named. But that’s the way things are, and it isn’t going to change. All things considered, she looks like a good judge with an excellent record who should be confirmed. So far. Excellent point, Brian. You might also have added that Justice Souter was a mistake for President Bush I. All federal judges have lifetime tenure, and once confirmed, they can do whatever they wish. The only threat to them is impeachment, which is virtually never done. Once on the Supreme Court, they no longer even have to think about ambitions to serve on higher courts. That freedom from constraints, plus the fact that judges learn and evolve like every human being, means that you never really know how they’re going to behave during their years or decades as a Supreme Court justice. I know there have been lots of justices that lots of people didn’t like, but given their power and complete freedom from accountability to anyone or anything other than their own consciences, I think we’ve done well over the years. The thing I don’t really understand about the judiciary is the notion of “fairness.” The judges know, or should, better than anyone, that “fair” decisions must be rendered within the confines of the law. Anything else is legislation from the bench and leads down the path to tyranny. Judges DO NOT, and should not, be able to nullify law, or make new laws up by deciding outside what the law dictates. The only people that have the authority to nullify the law are the ones sitting in the jury box, and even then their authority extends only to the case in question. However, if enough like-minded people sit on enough juries that are selected for the same group of offenses, legislatures will eventually strike down the law. Volstead is a perfect example of this.